Learn everything you need to know about chocolate to have the best eating experience. Learn how chocolate is made, how to identify good quality chocolate, tips on tasting chocolate (like wine!) and get some delicious flavour pairing ideas too! Easily the most adorable Easter chocolates that I’ve ever seen. I want that purple egg! 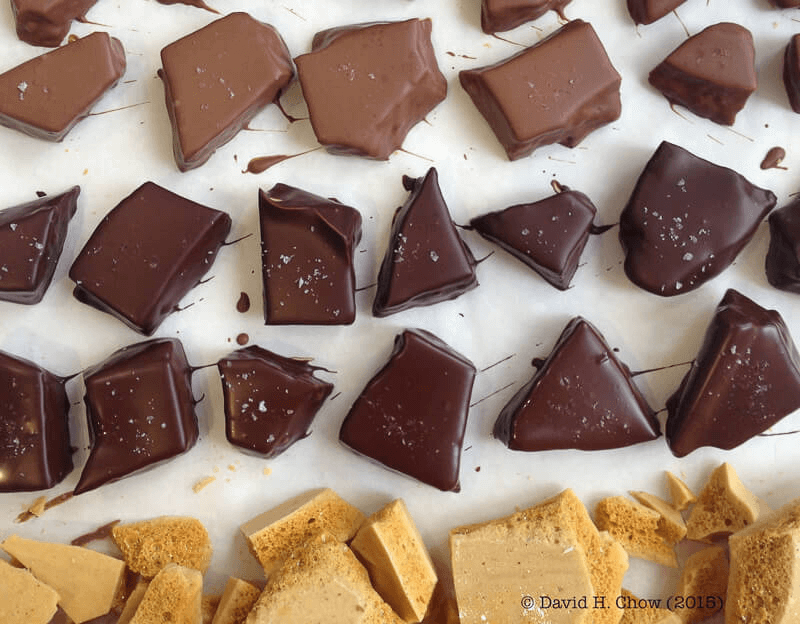 Editor’s Note: If you’re a chocolate lover, I think you’re really going to enjoy this article by Pastry Chef and Chocolatier, David Chow. You might remember him from the All The Best event that I wrote about a few years ago. 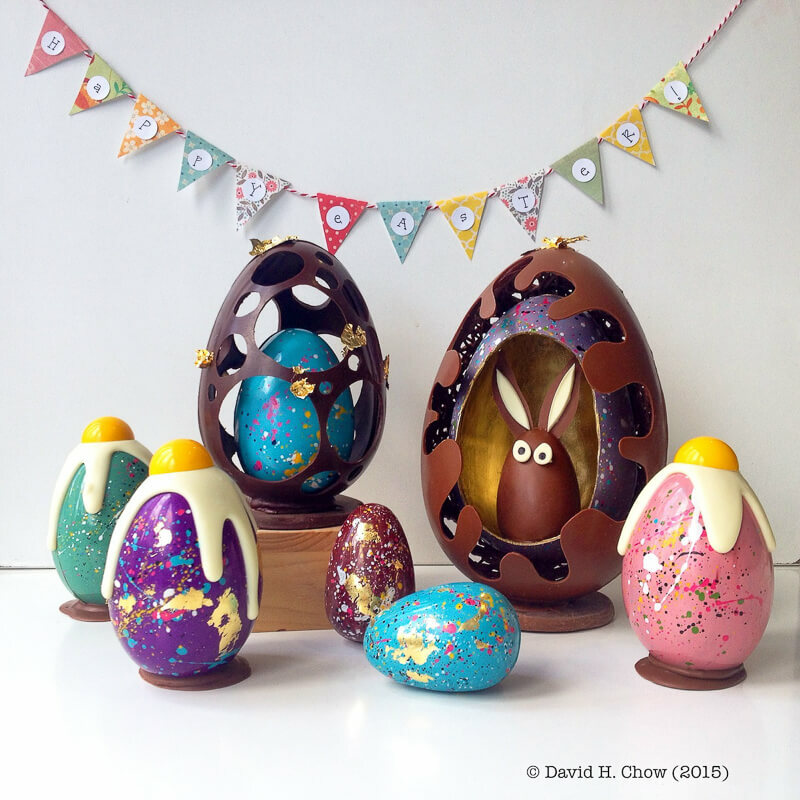 David’s passion for chocolate can be seen in every aspect of his work, from his hand-dipped candy bars to his playful season creations (just look at those Easter treats!). 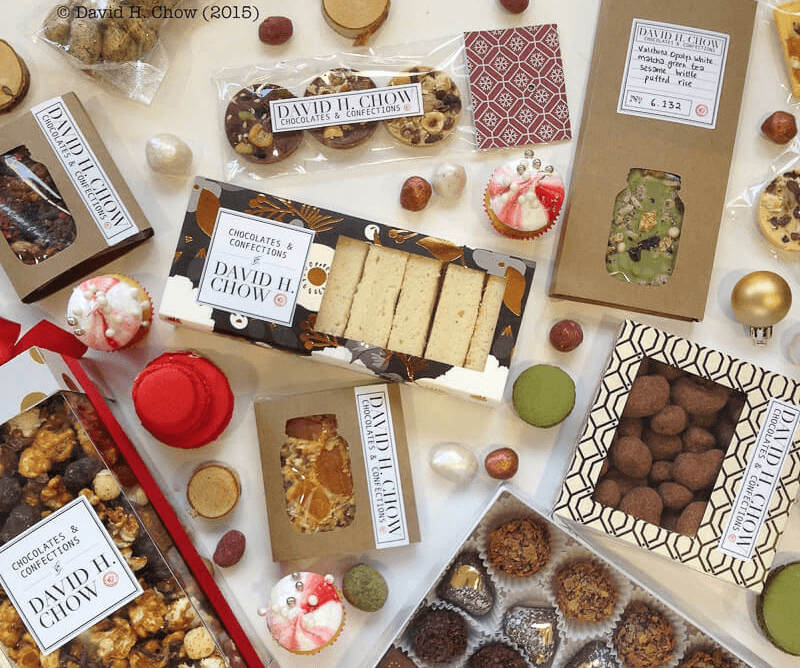 Whether it’s a hidden candy stash tucked away in your cubicle desk, or the jewel-like haute couture bonbons from chocolatiers in France and Belgium, chocolate enjoys a universal appeal that very few other foods have achieved. Crossing all cultural, geographic and economic boundaries, chocolate is what we grab for that sweet pick-me-up – no matter the time of day. Here are my tips for selecting, storing and (of course) tasting chocolate. It’s a tough job but someone’s got to do it! Just a tiny sampling of the treats that David can make. It is best to try chocolate plain and unadorned to be able to taste the differences in not just their cacao percentages and terroir but also how they melt on your tongue and coat your mouth. Nuts, fruits and spices are amazing for flavour and texture but can get in the way of the pure taste of chocolate. The percentage printed on the packaging actually refers to the percentage of cocoa solids (cocoa powder, cocoa butter, chocolate liquor, nibs…) that are in the bar. For instance when you buy a 75% dark chocolate bar, it means that 75% of that bar by weight has been derived from the cacao bean and the rest of the 25% is mostly sugar with some emulsifiers and vanilla thrown in if they’re used (plus milk if it’s not a dark chocolate bar). This is important since in US (where a lot of our chocolate is manufactured) cacao solids only need to make up 10% for it to be labeled chocolate. Just imagine what makes up the other 90%! 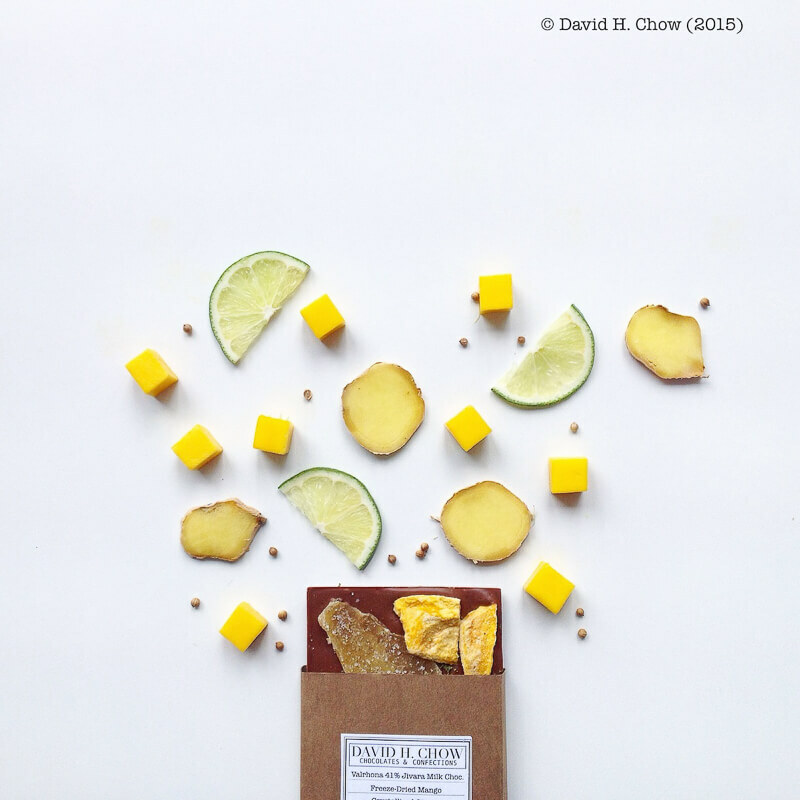 This chocolate has freeze-dried mango, ginger and lime in it! Try to avoid generic chocolate chips when conducting a tasting, as they are actually designed and manufactured so that they hold their shape when baked like in chocolate chip cookies. More often than not a portion of the cacao butter in these chocolates is replaced with much cheaper hydrogenated fats. Many grocery stores nowadays carry a large selection of chocolate from different brands. Just try to buy chocolate bars from a store that you know rotates their stock often! My favourite type of tasting is a dark chocolate tasting where I buy all the same percentage dark chocolate bars (say 70%) from different companies and compare the subtleties in their flavour and texture. The bars all contain pretty much the same ingredients, but their variance in flavour is sometimes astounding. This would be similar to tasting 5 Chardonnays or Cabernet Sauvignons side-by-side. The grape and resulting juice is exactly the same but where the grape is grown and how it is handled, processed and aged afterwards will result in drastically different wines! You should start with lower percentage chocolates first and move your way up since some of the high percentage chocolates will have a flavour that can be overpowering. 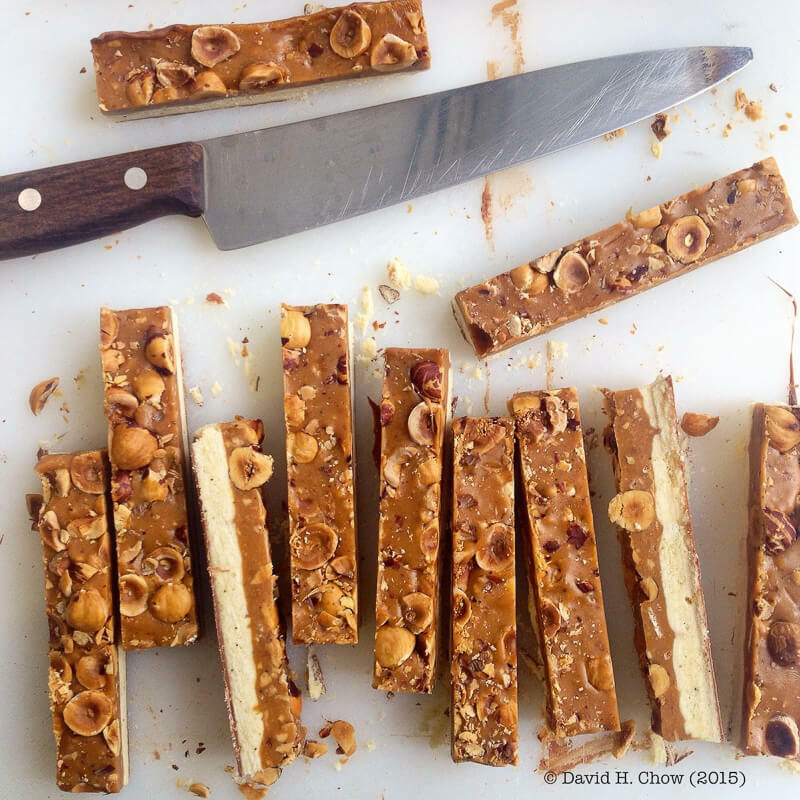 David gives us a glimpse at the process involved in making these hazelnut treats. 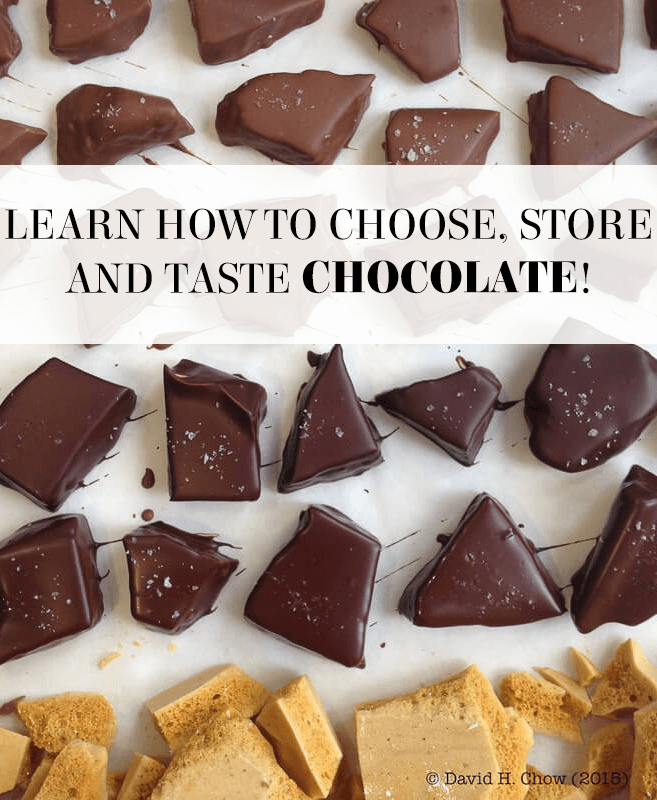 These steps will help you enjoy the process of tasting chocolate, whether you’re enjoying a square alone or throwing a tasting party for your friends! Since well-made and tempered bars will be shiny and glossy and will have an audible snap when broken. The appearance of a soft white layer indicates fat or sugar bloom means the chocolate was either stored of tempered improperly. Do not worry, as the chocolate is still completely edible! Even the colour variation in chocolate is amazing from deep red to almost pitch black in dark chocolates. Take in the array of different aromas, and try to single out any particular ones like red berries or nutty notes. If you detect a burnt aroma (like in certain coffees) it probably means the beans were over-roasted in order to hide the presence of lower quality beans. Don’t chew! The fat in chocolate, the cacao butter that is rock solid at room temperature, melts exactly at body temperature. Let the cacao butter completely melt and coat your entire tongue and mouth. The chocolate should have silky smooth texture. Please note that some small batch artisanal bars may have a slightly grittier texture, since it takes huge industrial conching machinery to grind the chocolate into tiny particles. If you notice that the melt and texture is kind of waxy it may indicate a substitution of fats in a lower quality chocolate. What new flavours have arisen? Toasty or floral? Is the texture or dense? Smell has a huge impact on taste. 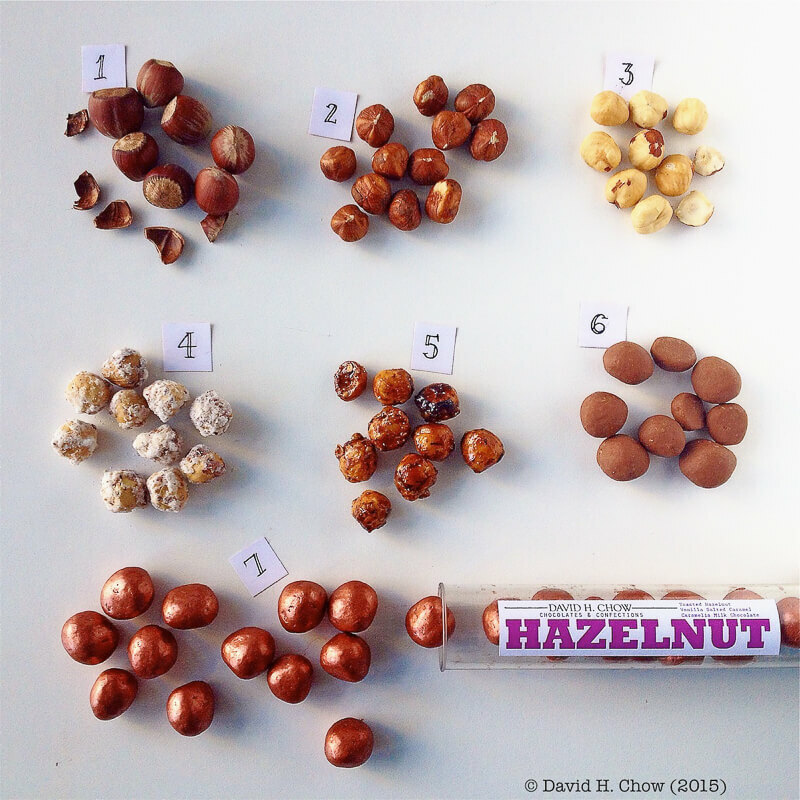 Note how the taste of the chocolate different from beginning to the middle to the end. Note the aftertaste. Does it linger on the palate or does the taste disappear right away. I find that I love eating chocolate with a lasting aftertaste as I only need to eat a little bit to keep the flavour going on and on. It’s important to refresh your palate by drinking water (unflavoured sparkling is best) before reaching for the next piece! Even a wedge of apple or piece of plain bread will do. 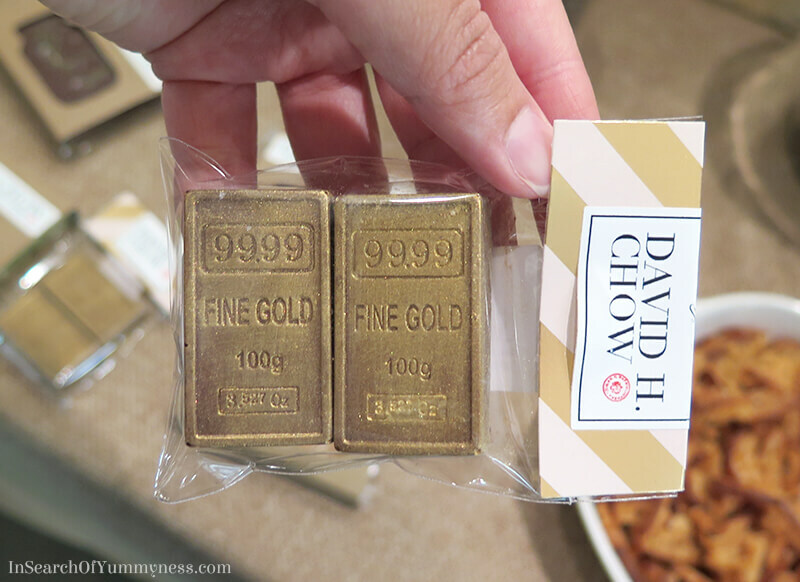 David enjoys using freeze-dried fruits in his chocolates! Feel free to experiment with your food and beverage pairings with chocolate. When having company over lay out an assortment of chocolates with your cheese board at the end of the meal. 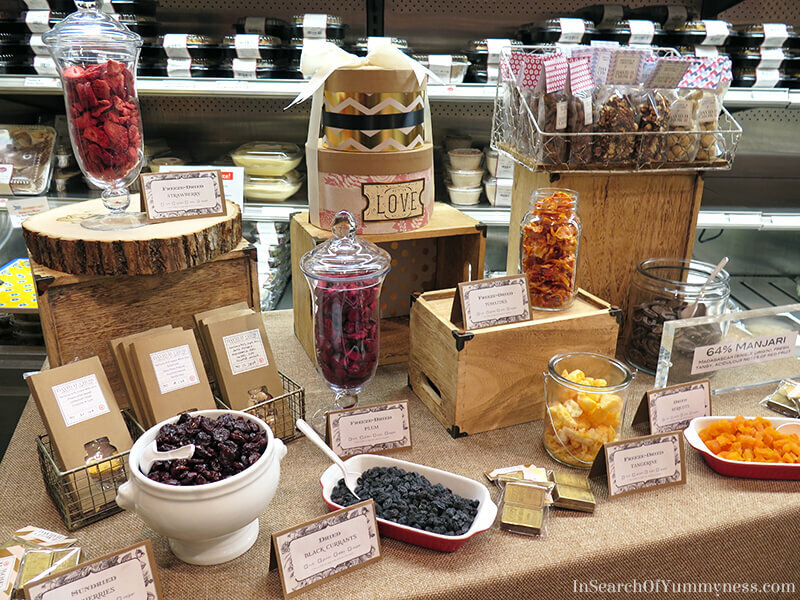 By mixing and matching with the assorted nuts, preserves, and dried and fresh fruit to see what works and what doesn’t. My favourite kind of chocolate to eat straight up. I love a good quality extra bitter (at least 65%) dark chocolate with a single malt whiskey or zinfandel. I also throw in a handful of that extra bitter dark chocolate into the pot when making classic chili. You won’t actually taste the chocolate but it adds a beautiful depth and earthy richness to the stew! Chocolate is actually very versatile in both sweet and savoury cooking. Don’t limit yourself to using it in just desserts! I love a milk chocolate bark studded with sesame brittle paired with a genmaicha (green tea with roasted brown rice). Even without the sesame brittle, the milky creaminess of the milk chocolate plays against the tannic astringency in the tea with the roasted nutty notes tying the two together. The green tea and milk chocolate combo is in my opinion similar to how pickled ginger refreshes your palate between bites of sushi! Makes you want to go back for more! I love a creamy square of (not too sweet) white chocolate studded with dried black olives. Sweet, salty and funky at its best! Sounds weird but a great combo. If you’re not a fan of white chocolate like many people I know there are many brands today that have reduced the sugar and increased the milk contents in their proprietary blends so the final bars are very different from the sickeningly sweet chocolate you had when you were younger. Give it a try and you’ll be surprised especially when paired with a coffee porter or stout that has deep chocolatey notes! Not all of the pairings will be a success and some will probably be downright dreadful! However some of my favourite pairings at first seemed initially downright strange to me like white chocolate and caviar or bitter dark chocolate with blue cheese and port. Experiment and have fun! Finally, please don’t forget that like with tea, coffee, beer or wine, a higher price does not necessary mean a higher quality product. As well, at the end of the day simply eat what you enjoy as every person’s palate is different. Plus everyone will perk up at the mention of a “chocolate tasting party”! So go ahead and pick up that bar…. your taste buds (and brain and heart) will thank you! While chocolate does have a long shelf life, you should always try to enjoy it when it’s most fresh! Here are some tips to help you keep your chocolate at its best until you’re ready to enjoy it. Store chocolate at room temperature in a place with low humidity and away from direct sunlight. Make sure to check the expiration date! Chocolate is shelf-stable, if properly stored, but the fresher the chocolate is the better it will taste. Solid dark chocolate bars have a shelf life of about a year, while solid milk and white chocolates bars will stay fresh for about 6 months. If the chocolate bar contains nuts, or fillings containing cream or butter, they can go rancid very quickly. Freshly made chocolate bonbons and truffles usually have a shelf life of 2 weeks, at most! As with all your foodstuffs, please always ask the chocolate maker how you should store his/her product, and read the ingredient label. Try your very best not store chocolate bars in the fridge or freezer as it will degrade its flavour and texture. As well there is a high risk of the chocolate will absorb unwanted odours and condensation. The chocolate plant’s genus, theobroma cacao, literally means food of the gods, which is a fitting name considering that chocolate is sought out, worshipped and devoured around the world. First celebrated throughout Mexico and South America, the plant today is grown mostly in tropical climates near the equator. The cocoa bean goes through a multitude of steps before it is transformed into the chocolate you’re familiar with. The beans themselves are the seeds of the beautiful brightly coloured fruit, which are extracted and fermented along with the white pulp for several days. The beans are sun-dried and then packed to be shipped off for processing. These are the same beans that are further cracked open to remove the inner nib portion, which is then roasted to bring out its characteristic flavours and aromas that started to develop during fermentation (similar to how green coffee beans are made palatable and develop their coffee flavour by roasting). The roasted cocoa nibs are then pulverized remove a papery skin and ground up. Through the application of continual friction and heat it becomes a thick dark brown liquid known as cacao liquor or paste. The paste can then be subjected to extreme pressure that extracts liquid cacao butter while leaving behind a solid block of compressed cocoa (called a presscake) that is further pulverized to make cacao powder! Lower quality chocolate is actually made by combining the presscake with vegetable fats that are much cheaper than the super expensive cacao butter. Every chocolate company, from small-batch makers to large multi-national corporations, has their own ratios for their specific blends. These mixes are then sent though machines called conchers where the liquid chocolate is continuously mixed and further ground in giant rollers from a few hours to several days to make sure it has a perfectly smooth consistency and remove any remaining acidic flavours that may be present. This process is super important to the final flavour and texture of chocolate so most companies are super secretive about their conching (how and how long). The beautifully fluid and mellow-flavoured chocolate is then tempered where the chocolate is heated and cooled successively to very specific temperatures to encourage the formation of cocoa butter crystalline structure (Beta V crystals to be exact). These crystals in the chocolate ensure that the final product sets up firm, is shiny and has a snap when broken (all signs of a good-quality chocolate). 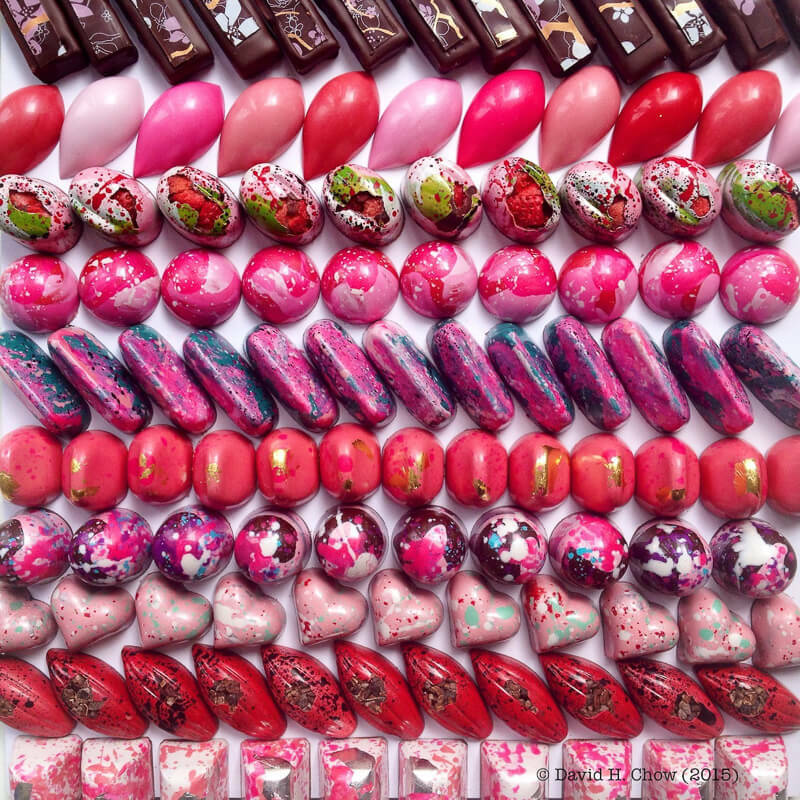 How pretty are these pink bonbons? Why Don’t All Chocolates Taste the Same? The concept of the terroir or character of chocolate is similar to that of coffee and wine. The environment where a cacao plant is grown alters some of its organic compounds resulting in surprisingly different flavour profiles from floral and acidic to woody and nutty. These differences in flavour can be muddled when blending beans from different regions and countries but the emergence of small-batch or bean-to-bar chocolate makers everyone are helping to preserve and accentuate the bean’s individual personality! Many larger chocolate manufacturers (similar to how blending is done with larger tea manufacturers) often mix chocolate from many sources to make sure that their chocolate’s flavour profile is uniform and consistent no matter where you purchase it the world. Antioxidant-rich chocolate is often called addictive since it contains positive mood and romance enhancing compounds like serotonin and endorphin-releasing chemicals and alkaloids like caffeine and theobromine (which is actually toxic to cats and dogs, so don’t let them sneak chocolate!). The purported health benefits of a sensible (yes, sensible) consumption of chocolate include maintenance of a healthy cardiovascular system, reduction in cholesterol and risk of stroke, and even the potential boosting of brain functionality. David developed his passion and interest in cooking from his early childhood in the Nation’s Capital and received formal training at Le Cordon Bleu Ottawa Culinary Arts Institute. He draws inspiration from his lengthy tenures as Executive Pastry Chef at the Drake Hotel (Toronto, Canada), Albany Luxury Resort Community (Nassau, Bahamas) and TRUMP International Hotel & Tower Toronto (Toronto, Canada) and from his few line cook jobs thrown in for good measure. He hopes to continue to be a driving force in the Canadian pastry scene through education and helping the industry and public alike to re-imagine chocolate and all things sweets. To learn more about David, visit his website: www.davidhchow.com. You can also follow him on Instagram (to see more beautiful photos!) or Twitter. David has given me permission to publish his photographs. I loved this piece, Shareba and David. I’m hankering for a chocolate tasting party now!